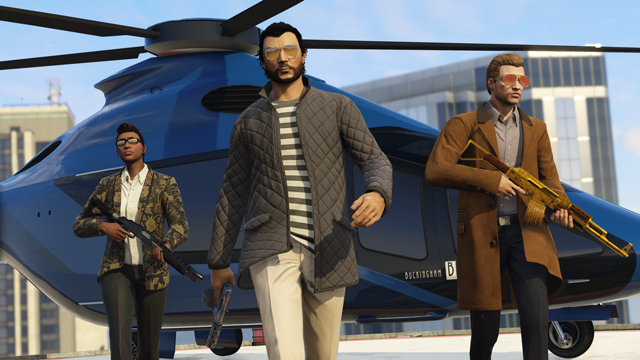 Continue your mission to become the ultimate criminal kingpin of Los Santos and Blaine County in GTA Online: Further Adventures in Finance and Felony, now available on PlayStation 4, Xbox One and PC. As CEO, you'll enjoy all the special abilities of being a VIP, plus access to a whole new frontier of black market opportunities with SecuroServ’s patented Special Cargo Network, allowing you to buy and sell illegal goods across a city-wide empire. To get your operation up and running, you'll need an executive office fitting the title along with a skillful team of hired Associates. Dynasty 8 Executive Realty, in partnership with SecuroServ, now have a new line of deluxe office suites specifically for the motivated career criminal. These masterpieces in executive design come with a full-time assistant, helipad, boardroom, Don’t Cross the Line arcade game, and optional storage space like the Gun Locker, allowing you to personalize your perfect weapon loadout before you go on the job. 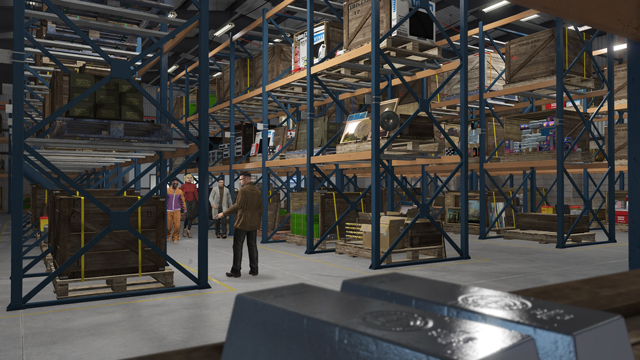 An executive office also includes private access to the SecuroServ Special Cargo Network, which you’ll use to invest in Warehouses and traffic rare and exotic product throughout the city. Warehouses store all Special Cargo and storage space is valuable; manage your inventory wisely and maximize your margins by selling when the prices are right. •Headhunter: Assassinate key targets across the map against the clock. •Airfreight: Liberate some valuable cargo from its armed guard and fly it to safety. •Haulage: Be the first to deliver a trailer full of tax-exempt merchandise to its wrongful owner. 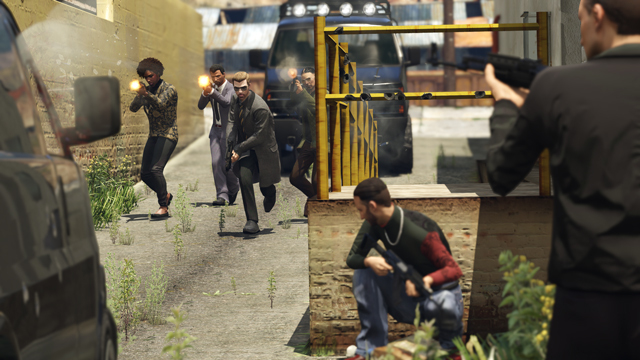 • Cashing Out: Be the pack leader in the latest wave of ATM fraud to hit the streets of Los Santos. • Salvage: Compete to retrieve the most lost cargo from the ocean floor. Do you have a taste for the brutally fast, the brutally efficient or the just plain brutal? Whatever your preference, the latest wave of NEW transport options is bound to hit your sweet spot. From the monstrous HVY Brickade available at Warstock Cache & Carry and menacing Bravado Rumpo Custom from Southern San Andreas Autos, to the new generation of Super and Sports cars now in stock at Legendary Motorsport like the Pegassi Reaper, Vapid FMJ, Grotti Bestia GTS and Enus Windsor Drop, to the luxurious and speedy Buckingham Nimbus and Volatus from Elitas Travel and even the hulking Tug available on order from DockTease, getting from A to B has never looked and felt this good. 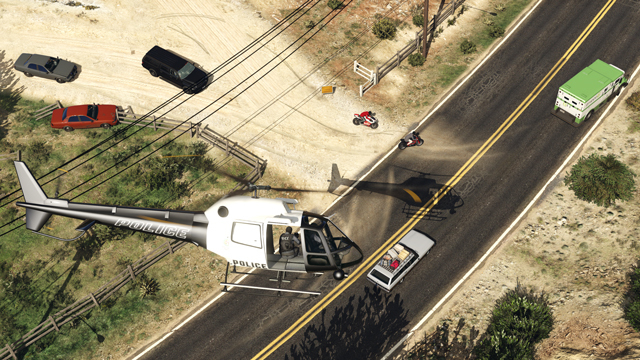 Previously exclusive VIP and bodyguard clothing plus all-new SecuroServ branded merchandise are also hitting the clothing racks in Los Santos. Whether you want your first impression to be a sophisticated crime lord or a gorilla for hire, there’s something just right for you. And nothing wrecks an otherwise solid Special Cargo mission like running short on ammo. Unleash a barrage of bullets from a range of weapons by grabbing Drum & Box Magazine attachments from your local Ammu-Nation. In the land of the Haves and the Have-Nots, this Adversary Mode is your chance to engage in some aggressive social climbing. The Winners team is destined for success, the Losers team is doomed to fail, and there’s only one way to move between the two: ruthlessly murder a Winner and take their place. There's also Double RP to benefit from this week when trying out this new Adversary Mode, compliments of the Playlist that's available directly from the GTAV boot screen. An Executive office is not complete without being donned with spoils of crime. Try your luck in the Social Club Executive Merchandise Sweepstakes featuring tons of paraphernalia fit for a criminal kingpin. Hang your very own GTAV Air Freshener in your ride while wearing a slick Grotti Polo and blaring your GTAV Vinyl Soundtrack, light up a fat cigar with the official GTAV Chrome Zippo, spruce up your office desk with a GTAV Gold Bar USB, iFruit Mouse Pad, and Epsilon Paper Weight, and transform your fridge into a safe for all that cold hard cash with the GTAV Kitchen Timer. Head over now to the Social Club Events Page to enter. 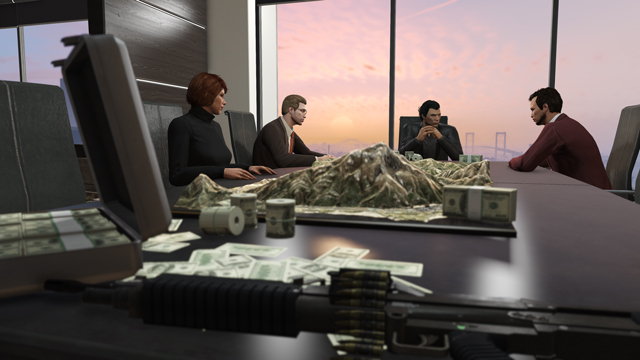 Celebrate your climb up the corporate criminal ladder with proper photographic documentation, and add a cool GTA$1M to your asset portfolio in the CEO Snapmatic Competition. Eligible photos must be published between today and the end of the day on Monday, June 13th - and must feature content from Further Adventures in Finance and Felony. 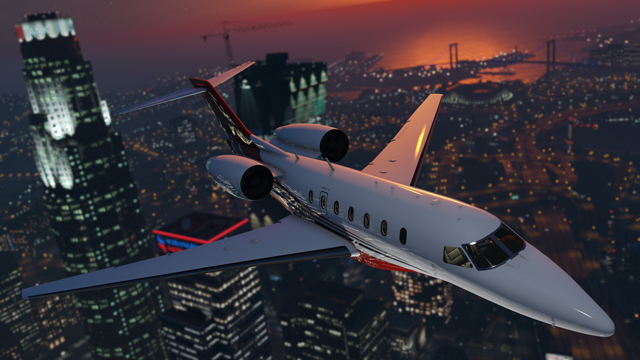 Also, make sure to tag your photo with "CEO" on Social Club. Full rules here. 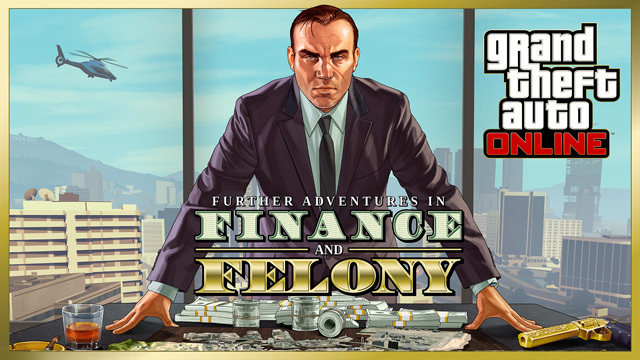 On Friday, June 10th at 5pm ET, join in at either the official Rockstar Games Twitch or YouTube channel for a live stream featuring Further Adventures in Finance and Felony, hosted by the Rockstar Broadcast team and featuring special guests to be announced. Further Adventures in Finance and Felony Out Now - It's here! 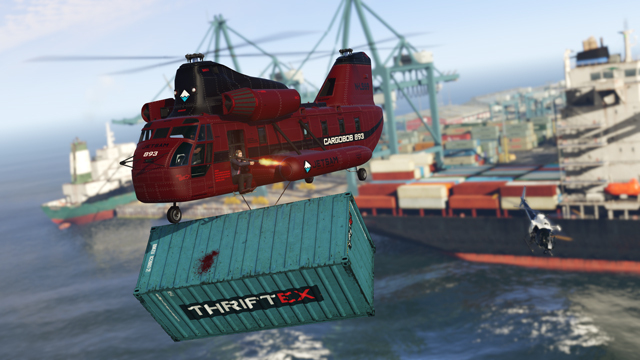 Expand your criminal empire with loads of new illicit ways to earn GTA$!